Preheat the oven to 400˚ F. Have a 9 x 9-inch baking dish ready. In a large bowl, combine the black beans, corn, green onions, cilantro, oregano, garlic powder, cumin, and salt. Spread a thin layer of tomatoes over the bottom of the baking dish (approximately one fifth of the total amount). Layer with a 3-4 lasagna noodles, breaking them as needed to fit the pan. On top of the layer of noodles, spread about one third of the bean mixture. Layer evenly with about one quarter of the remaining tomatoes and drizzle lightly with hot sauce. Sprinkle with one quarter of the cheese. 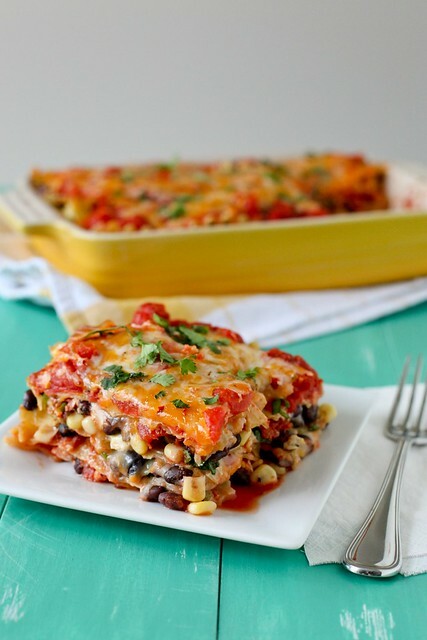 Repeat the layering process two times more (noodles, beans, tomatoes, cheese, noodles, beans, tomatoes, cheese). The last layer will be noodles, tomatoes, and cheese. Cover the pan tightly with aluminum foil. Bake 35-45 minutes, or until noodles are tender and cooked through. Remove the foil from the top and bake 5 minutes more, until the cheese is melted. Remove from the oven and let stand at least 10 minutes before slicing and serving.